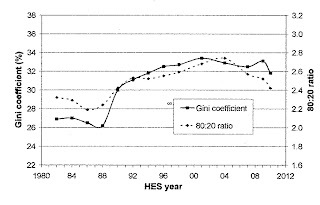 To briefly recap where this series started: Auckland has changed in a generation from an equal city in 1986, when median incomes of most suburbs were bunched tightly around the regional average, to an unequal city by 2006, where median incomes of the city's 300-odd suburban census units spread widely across the income scale. Similar increases in inequality have occurred across many developed countries. The driving forces have been both technological changes, which have strengthened the power of the skilled at the expense of the unskilled; and policy changes, which have weakened unions, opened markets to free trade, cut taxes on the rich and imposed new taxes on spending that bear most heavily on the poor. To my mind he has omitted the most important factor. The change in family structure. Single parent families are amongst the poorest. The percentage of families with dependent children that are single grew nationally from 18 to 28 percent between 1986 and 2006. 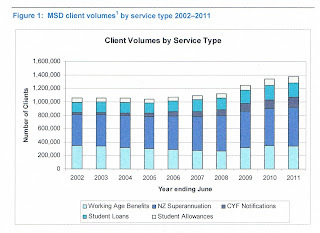 I don't have specific Auckland figures but am willing to bet the percentage there is higher based on DPB numbers. Reconstituted families are also poorer given ongoing obligations to past partners and children. Collins might argue that this change has been an effect of all of the above in that unemployment can cause family breakdown and there aren't enough unskilled jobs to go around. I would argue that people respond to inevitable change. Human beings are highly adaptable. Some will react positively to change by making an effort. But some will take the easy option and adapt accordingly. And the benefit system made it all too possible to take easy options. So naturally, over time, the gulf between these two groups will widen. At the caring end of the spectrum, the Child Poverty Action Group has been lobbying for more help for low-income families since it was formed in 1994. Its biggest campaign has been to pay the $60-a-week "in-work tax credit" to parents who lose their jobs or can't work, as well as those in paid work. Since 59 per cent of children in poverty live in homes with no full-time worker, this change alone would slash child poverty. So there is the acknowledgement that a majority of the children in poverty are in single parent homes (only a small portion are in two-parent homes dependent on the unemployment or other benefit). But how can he be so certain the move would slash child poverty if another predictable effect was to draw more children onto benefits? Further answers feature more redistribution of wealth for housing, public transport, pre-schools, youth jobs, etc via the ratepayer. The great Super City solution. Beyond these local moves, a more fundamental shift in the policy balance might mean picking up ideas from the Council of Trade Unions' alternative economic strategy, such as raising the minimum wage to two-thirds of the average wage, strengthening rights to negotiate wages collectively, raising the top income tax rate to 45 per cent and allowing a tax-free income band at the bottom. - For half of households with dependent children the amount received through welfare benefits and tax credits is greater than or equal to the amount they pay in income tax. - Single-earner two-child families with less than $55,000 from wages pay no net income tax. They receive more from WFF tax credits than they pay in income tax and ACC. When all households are counted (working age with children, working age without children, and 65+ households), and looking at households grouped in deciles rather than looking at individual households, the total income tax paid by each of the bottom five deciles is less than the total transfers received (tax credits, welfare benefits, NZS and so on). It is only for each of the top five deciles that total income tax paid is greater than transfers received. 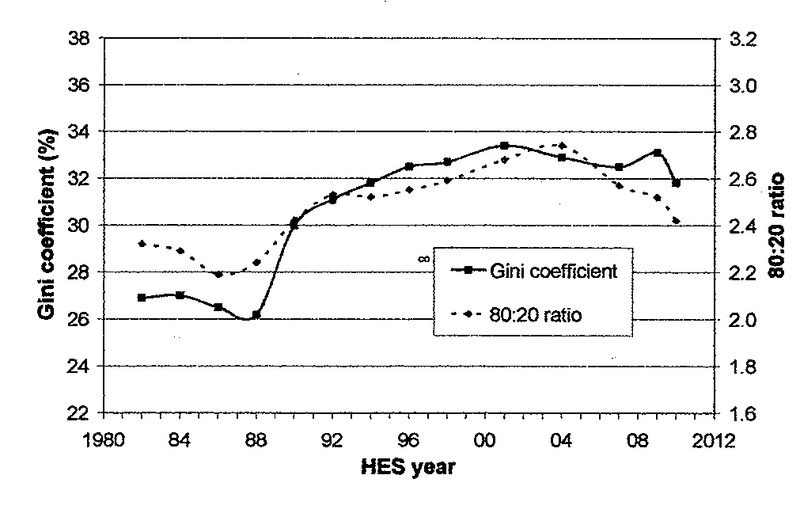 · Inequality remained much the same from 2007 to 2009 – the 80:20 ratio declined a little and the Gini rose. From 2009 to 2010, inequality declined on both measures. · The lower figures in 2010 compared with 2007 reflect two changes: (a) the recent (2009 to 2010) decline in real incomes for the top two deciles (lower investment returns especially), and (b) a small real gain for lower deciles. On the latest OECD figures (c2008), New Zealand’s Gini score of 33 was close to those of Australia and the UK (34), Japan (33) and Canada (32), and a little above the OECD-34 median (31). Countries such as Denmark, Norway and Sweden have lower than average inequality (Ginis of 25-26). The US score is 38. New Zealand’s Gini score in 2010 was 32. Yes Auckland has an ethnic mix which features some of the countries lowest incomes due to large or lone parent families, unskilled migrants and expensive housing. But I look forward to Collins repeating the exercise when this year's Census figures become available. Readers of the NZ Herald are sending their own photos of bottle-feeding babies in a show of support for Piri Weepu. Here's my submission. The big sister revels in her role. Public health officials have increasingly claimed a large responsibility to legislate health to society at large, propping up the mandates of the Nanny State at the expense of personal freedom. Relying upon a number of pseudoscientific arguments, these vocal advocates argue that the state must enforce certain behavior among its citizens for one of two reasons: first, the state must protect people from themselves, or second, the state must protect people from others who would encroach on their autonomy, says Michael Keane of the Institute of Public Affairs, a public policy think tank in Australia. In campaigning that we must protect people from themselves, public health officials ascribe to the "disease model," whereby a person's actions are divorced from his or her own decision making. In the case of a person who gambles recklessly, their actions are excused as a biological necessity -- that this person is predisposed to the addictive behavior and should therefore be protected from it by legislation. This level of intrusion, however, far exceeds commonly accepted standard for medical ethics as it arguably defies much of what we might call being human. Furthermore, it fails to incorporate willpower as a relevant force in its model, thereby removing culpability and the importance of self-control from consideration. Another tactic that is equally pervasive among public health advocates is to focus on the damaging effects of one's actions to third parties. This can be seen in one-to-one arguments, such as the effect that one's choice to smoke has on the inhaler of second-hand smoke, and one-to-many arguments, such as the effect that one's choice to smoke has on society's health care costs. The fundamental difficulty with both of these systems and the policies that they advocate is that they limit personal choice -- an idea that in numerous other spheres created great prosperity throughout the Western world. When one recognizes that most people are rational actors and capable of weighing the costs and benefits of an action if aware of them, the need for the Nanny State is diminished. Source: Michael Keane, "Ideology, Not Science," Institute of Public Affairs, January 2012. The race relations commissioner has criticised some Pakehas' "lack of generosity" towards deprived Maori as Waitangi Day celebrations have again turned violent..... Race Relations Commissioner Joris de Bres criticised those Pakeha who still resisted moves to give "special treatment" to disadvantaged Maori, thousands of whom suffered inequality. "I still have a sense that there is a lack of generosity in some Pakeha attitudes to Maori and there is a lack of will to see measures taken that will help to remove that disadvantage and there is a lack of understanding of this notion that it is actually fair to deal specifically with people who are suffering unfairness." The very person charged with improving race relations stirs up ill-feeling with these sorts of comments. 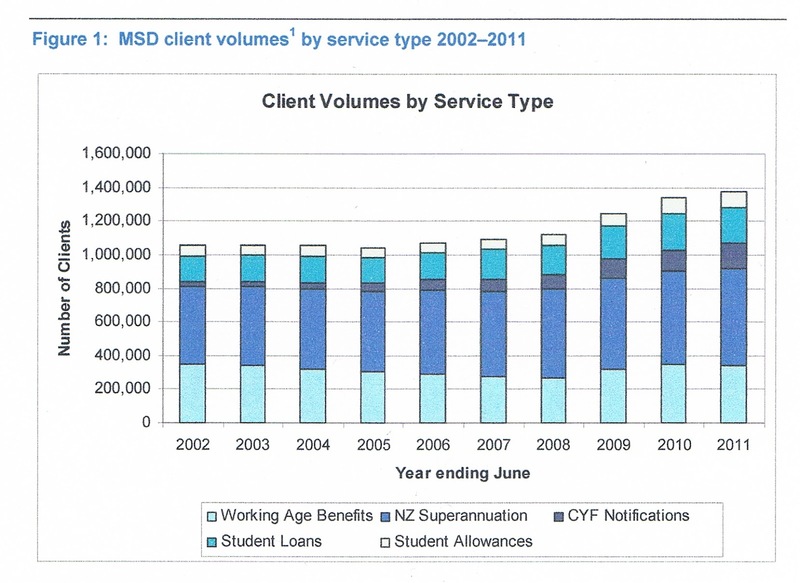 What does "special treatment" to "disadvantaged Maori" consist of? Is he talking about affirmative action? Within the welfare-state model New Zealand operates under (which I don't support) I don't particularly care if Maori get funding to do their own thing, for example Whanau Ora. Or run their own schools. Or their own health clinics. Or their own youth courts. I think the jury is still out on how (relatively) successful these initiatives will prove to be. But if 'measures to remove disadvantage' includes the vast transfer of cash to fund the DPB for example, which is now a firmly entrenched part of Maori culture, then yes, I do feel a distinct "lack of generosity". And I think I have amply explained why over and over. It is Pakeha generosity that has allowed the deprivation of Maori to accelerate through welfare benefits. It is the benefit system that has absolved Maori (and other deprived people) from becoming better educated, skilled and responsible. it is hardly surprising if some of us bristle. "When reforms finally do occur, they will happen not because stingy people have won, but because generous people have stopped kidding themselves." You just can't frigging win in this country. Give up Piri. You'll never beat or even meet the fanatical expectations of mammary maniacs. Never mind that you are actively fathering, hands-on, taking responsibility, and caring for your kids. You haven't got breasts so forget it. Seriously, breast is not necessarily best. There are all sorts of situations when bottle-feeding - or a combination of bottle and breast - is necessary or even desirable. The value in having a Maori All-Black showing how to be a father far, far outweighs any value in constantly shoving compulsory breast-feeding down every-bodies throats. On second thoughts Piri, don't give up, just tell them where to go. Well, well, well. An astonishing reaction to this story in the NZ Herald. I have read through some of the 334 comments. As yet I haven't found one in support of the decision to pull the footage of Piri Weepu bottle-feeding his baby. The reactions range from puzzlement to very real anger. Some phrases used to describe La Leche etc like "Breastapo" and the "breast-feeding mafia" give you a taste of the flavour of most comments. And they wonder why men are so marginalised from children nowadays, can't teach 'im, never touch 'im, in the same breath they will be saying men aren't doing enough to be a positive influence on children. Really is it any wonder why we have one the highest depression rates in the world. Who pulled the images they should be fired, lets get some mens rights back. From the Briefing to Incoming Minister of Social Development.